Shell Lubricants is the number one global lubricant supplier, delivering market-leading lubricants to consumers in over 100 countries. With decades of innovation behind the iconic Shell Pectin logo, Shell Lubricants brings world–class technological insights to its products. Shell manufactures and markets lubricants and greases for a full range of equipment and applications designed to optimize equipment efficiency. Since 1961, Shell Lubricants and Overlake Oil have partnered to offer innovative, high quality industrial lubricants to the Pacific Northwest. 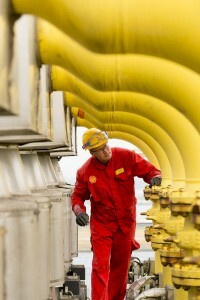 All of Shell’s product lines are approved for many industry specifications, standards and OEMs. Please contact us if you have a specific need. Tellus is a full range of hydraulic fluids for an assortment of applications including industrial, manufacturing and machine use (“M” range) extended temperature operation for manufacturing and mobile use (“V” range) and detergent based fluids for aqueous environments (“VA/MA” specialty products). The Tellus products contain four tiers (1-4) of which the higher numbers indicate an increase in efficiency and protection. Tellus is available in 10, 32, 46, 68 and 100 ISO viscosities. Shell also offers fire-resistant and environmentally considerate hydraulic oils through the Irus and Naturelle brands. Morlina is a full line of bearing and circulating oils for a wide range of equipment designs and uses including industrial applications (“B” range) metal sectors and aqueous environments (“BA” range) and extra low viscosity grades for high speed machine spindle applications (“BL” range). The Morlina products contain three tiers (2-4) of which the higher numbers indicate an increase in efficiency and protection. This extensive range is available in 2, 5, 10, 22, 32, 46, 68, 100, 150, 220, 320, 460, 680 and 1000 ISO viscosity grades. Omala is a full line of industrial gear oils for standard to demanding high-load and extended-duty applications including enclosed industrial spur and bevel gear applications (“G” range) as well as worm-drive applications (“W” range). Omala products contain three tiers (1, 2 and 4) of which the higher numbers indicate an increase in efficiency and protection. This range is available in 68, 100, 150, 220, 320, 460, 680, 1000 and 1500 ISO viscosity grades. Shell also offers a full range of automotive gear, axle and transmission oil to meet the needs of on-highway vehicles through the Spirax brand. Corena is a full line of compressor oils for rotary vane and screw compressors in stationary and mobile units (“R” range) and high-pressure, reciprocating or piston applications (“P” range). Corena products contain three tiers (2-4) of which the higher numbers indicate an increase in efficiency and protection. This range in available in 32, 46, 68, 100 and 150 ISO viscosity grades. Shell also offers a full range of refrigeration oils suitable for use in carbon dioxide, ammonia and hydrofluorocarbon refrigeration systems and gas compressor oils suitable for use in hydrocarbon and chemical gas compression applications through the Refrigeration and Gas Compressor product lines. Gadus is a full line of multipurpose greases for use on bearings carrying low loads at high speeds (“100” range) extreme pressure applications for bearings carrying medium loads at medium speeds in dry environments (“220” range) as well as wet environments (“220A” range) and heavy-duty greases for bearing carrying heavy loads at low speeds or shock loads (“460” range). Gadus products contain four tiers (2-5) of which the higher numbers indicate an increase in efficiency and protection. Gadus is available in 00, 0, 1, 1.5, 2 and 3 NLGI grades. There are many specialty grease ranges for specific applications, please contact us for additional information.